In tropical countries, their summer season is slowly coming to an end, while in western countries, it is still fast approaching. So to keep this article appropriate regardless of the location of whoever is reading this, let’s just use the term beach season, since these are the perfect months to go to the beach. During these months, the temperature of the sun’s heat is just right to give people that tan complexion that they’ve been longing for all year round, and the temperature of the ocean is ideal for swimming. You may also see summer party flyers. Also, the beach season is home to so many parties and events, and these are mostly attended by school-aged teenagers and young adults. The reason behind this is because of spring and summer breaks, which means people in this age group are free from school and homework, giving them a chance to party all they want. 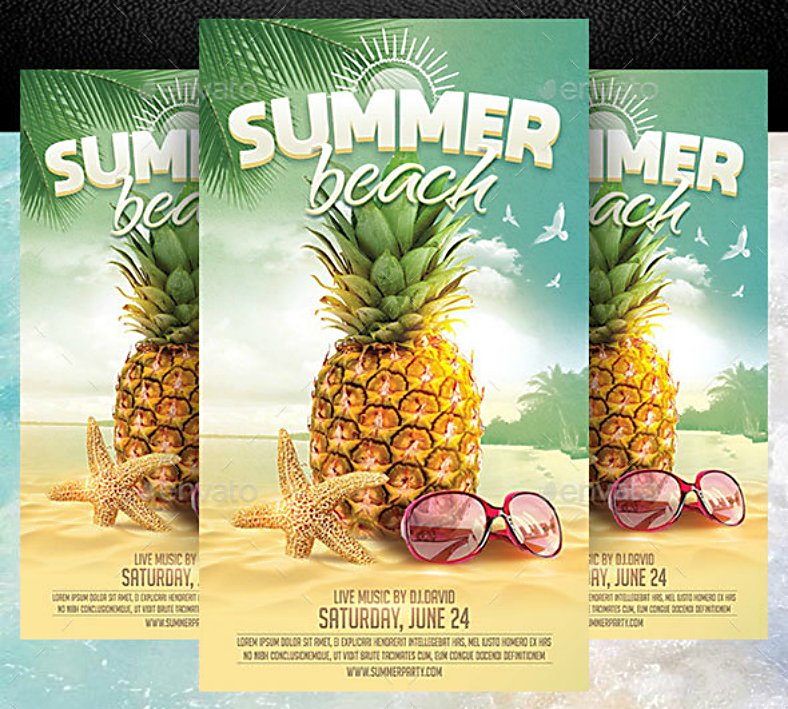 If you’re an event organizer and you’re planning on hosting a one of a kind beach party, then you might as well use one of our one of a kind flyer templates to spread the news to the general public. 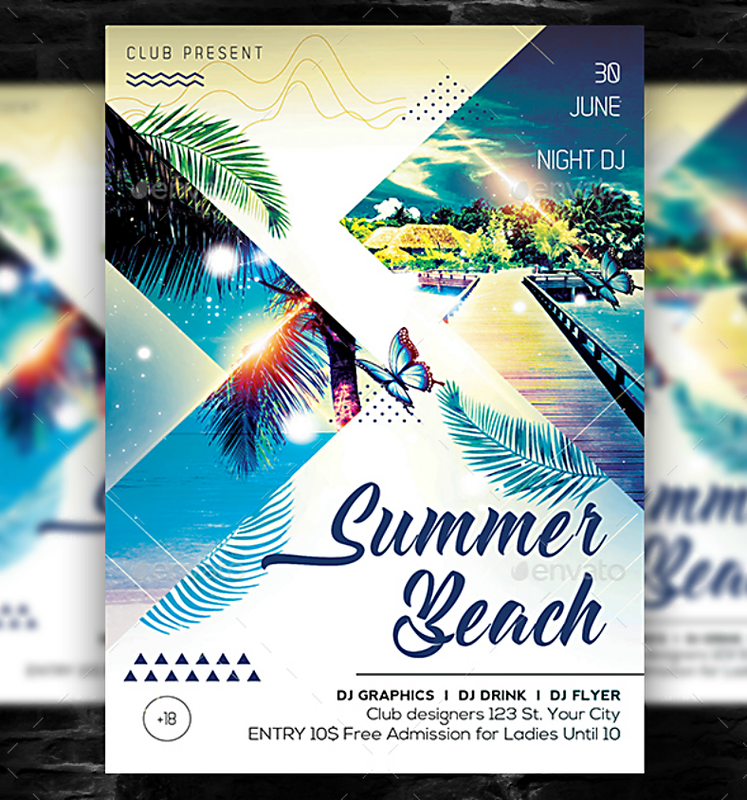 Feel free to check out the party flyer templates below and let us know if you were able to find one that perfectly works for you. 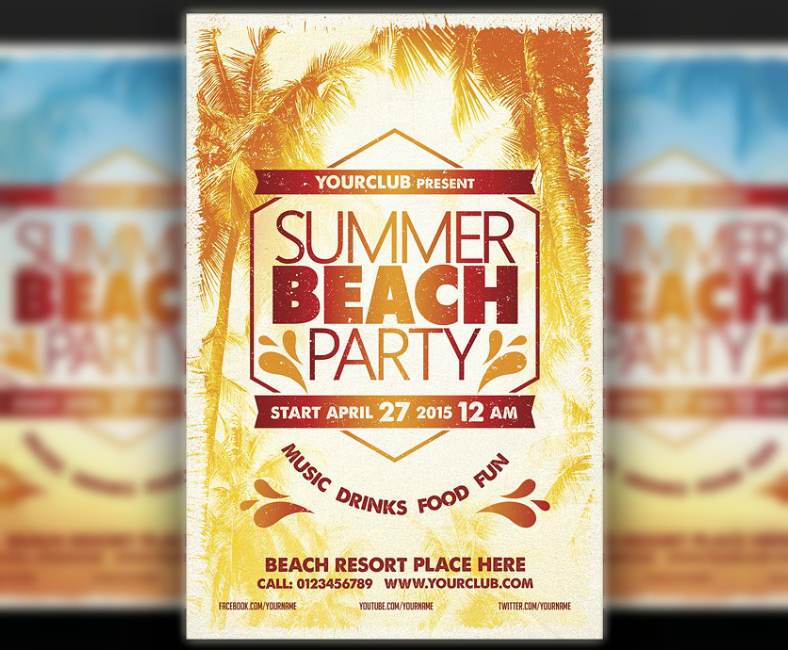 Do you prefer a rustic look for your beach party flyers? 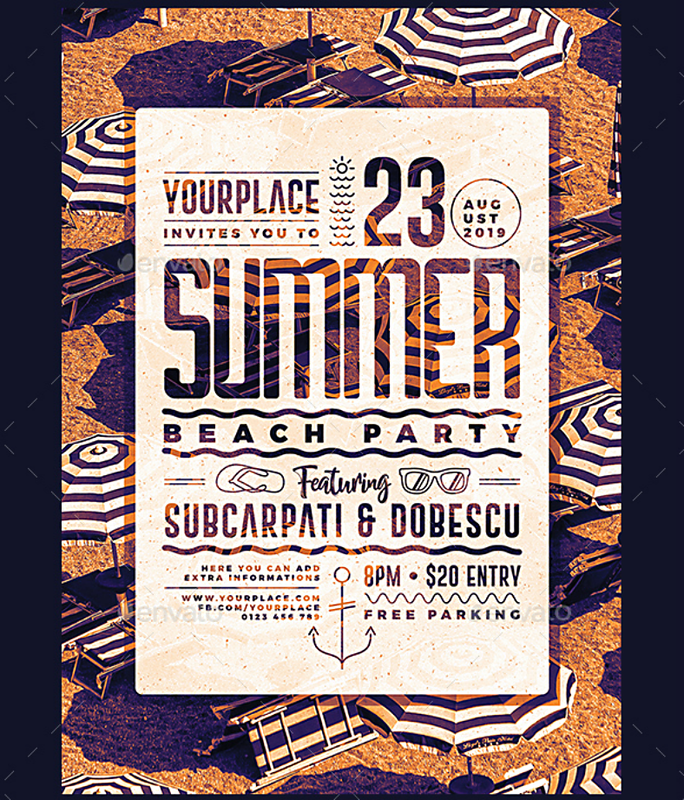 Check out the flyer design template above and see if it is rustic enough for you. If it is and that’s exactly how you like it, then feel free to click on that download button. Who Uses Flyers? And Why? 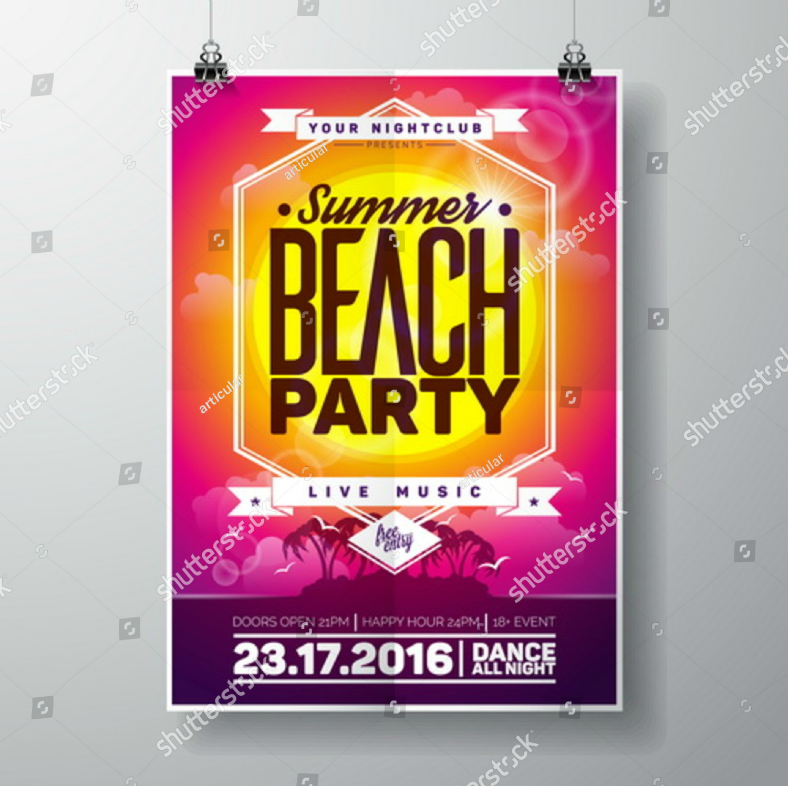 Flyers are commonly used by businesses and organizations, or any party that wishes to promote something to the general public. The reason for their use of flyers is to advertise a newly released product, another is to inform the public of their best-selling products, or they may also use it to promote the entire business itself. For organizations, their purpose for using a flyer to mostly to spread awareness to the public. But there are also instances when flyers are being used by organizations in order to recruit new members. And the last purpose of using flyers closely resembles invitations because flyers can also be used to make announcements for events. 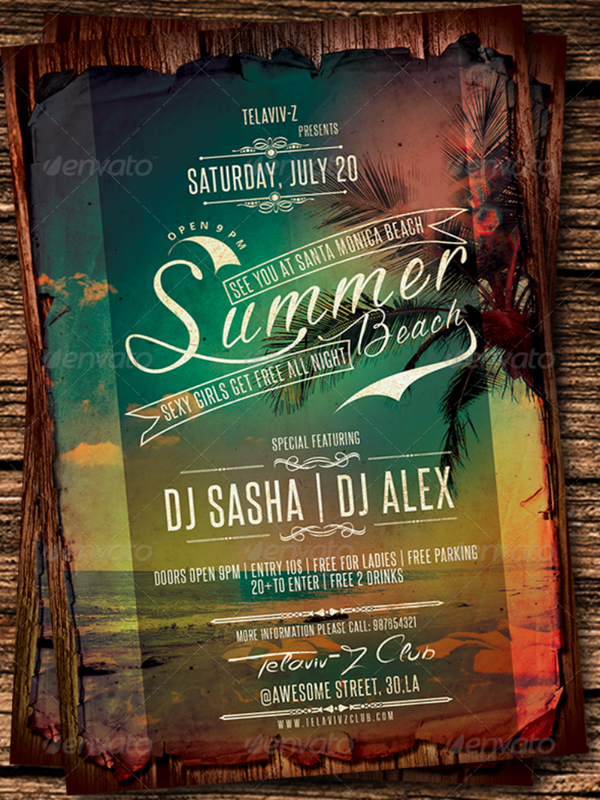 Check out the beach party event flyer template above, it shows a piece of wooden plank floating on the water. Now, how could it get even more appropriate than that? 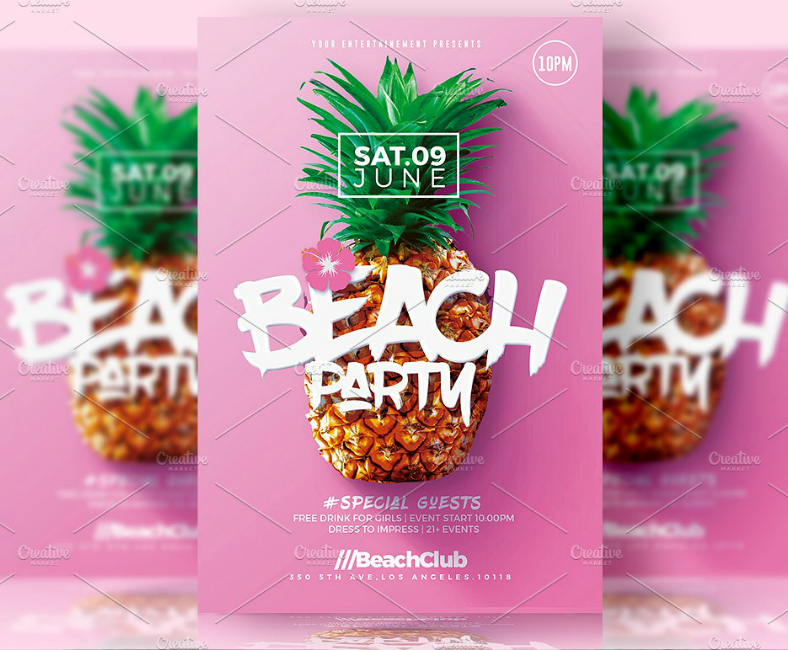 The sample flyer template above shows a scenic view of the blue beach with a row of coconut trees in the background. 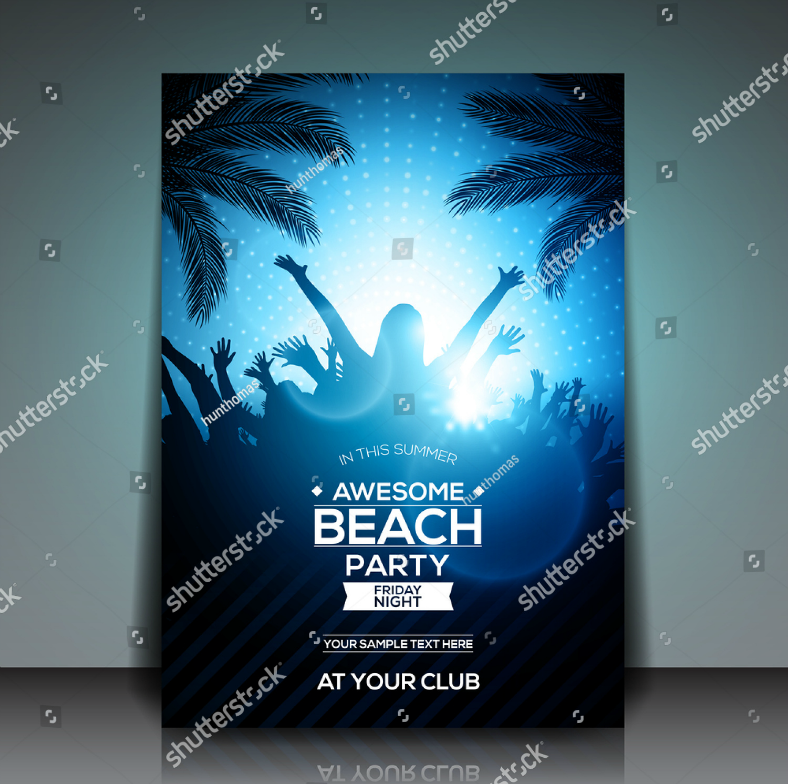 If you like the idea of this template, but want to add a personal touch to it, provide yourself with your own picture of a beach view and incorporate it onto this flyer template. Now that we know who and why flyers are being used, let’s dig deeper to that “why” and elaborate more on the importance of flyers. After all, there has to be a reason behind why the traditional flyers are still preferred even with all the digital alternatives available. You may also see summer party flyers. 1. For one thing, flyers are indeed inexpensive and are probably the lowest cost option among all the other methods for advertising. With flyers, you can already assure yourself of cost-effectivity as well as a reasonably high return on investment. Whether you decide on designing flyers yourself or having them made by third-party printing industries, you will never need to spend a lot just to make your own flyers. 2. Aside from just being inexpensive to design and produce, flyer distribution doesn’t really require you to exert THAT much effort, but you will need to have knowledge on what you are trying to promote. The thing with flyers is that it promotes interaction between the advertiser and the prospect, and if the latter has some inquiries or needs clarifications, the former should be able to shed some light into their concerns. 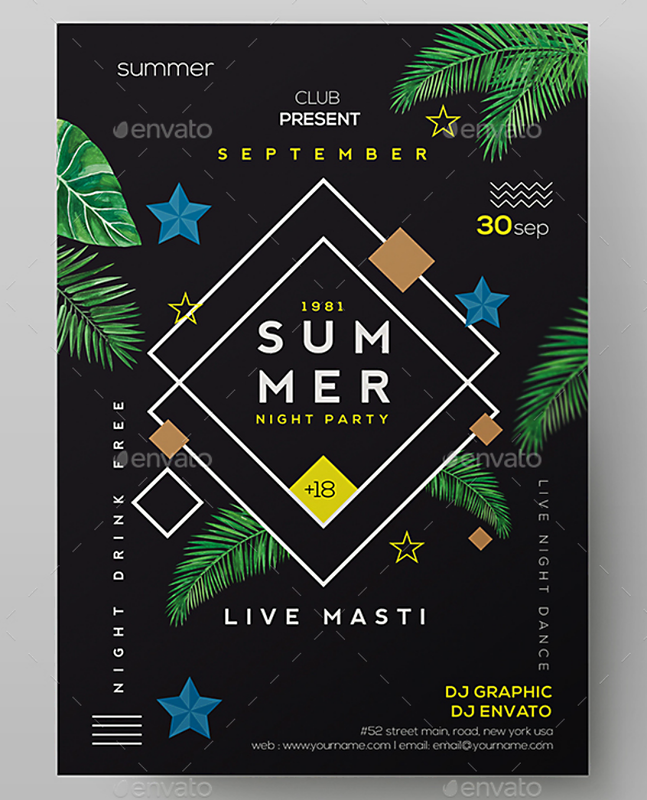 You may also see free party flyer templates. 3. The use of flyers allows you to measure the success rate of your marketing campaign, but this may need some basic mathematical computations. When doing your flyer distribution, take note of the total number of flyers that have actually landed in the hands of prospects and compare that with the actual number of prospect-turned-paying customers. Whatever the result, you can then determine whether your campaign had been successful or not. 4. People love tangible tools, and the more that they would love it if the tool is visually attractive. This is another advantage of using flyers—especially for those who decide on making their own flyers—they can get as creative as they want and can even add their own personal touch to the design. When doing this though, make sure not to make the design over the top so as not to make it look cluttered. 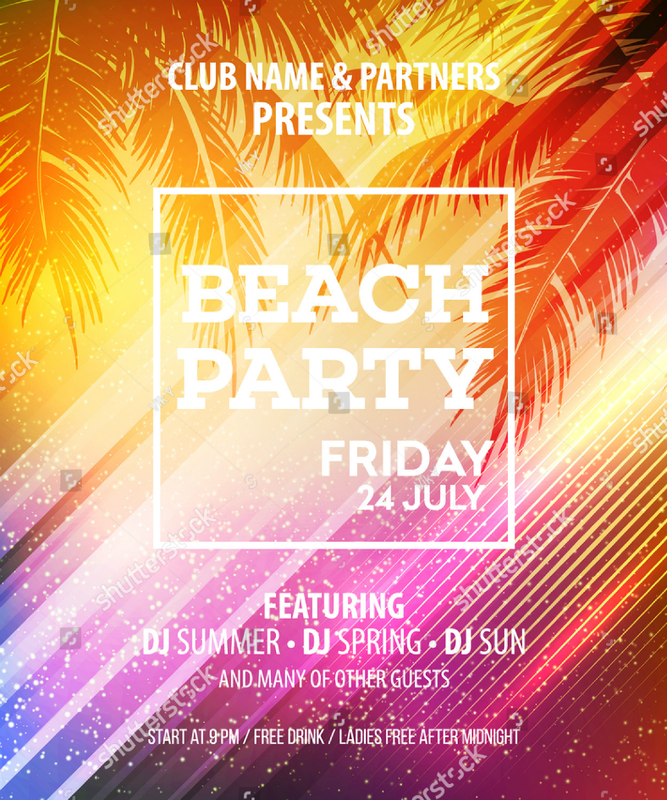 You may also see beach party flyer templates. 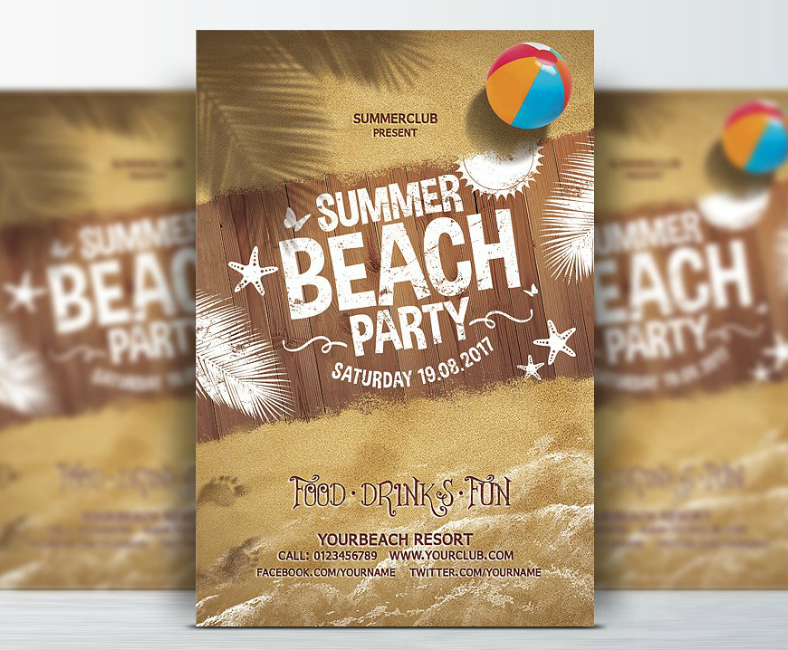 Make your beach party flyers all the more exciting by incorporating attention-grabbing photos of beautiful subjects onto the design. However, keep it as appropriate as possible to avoid complaints from grown-ups. 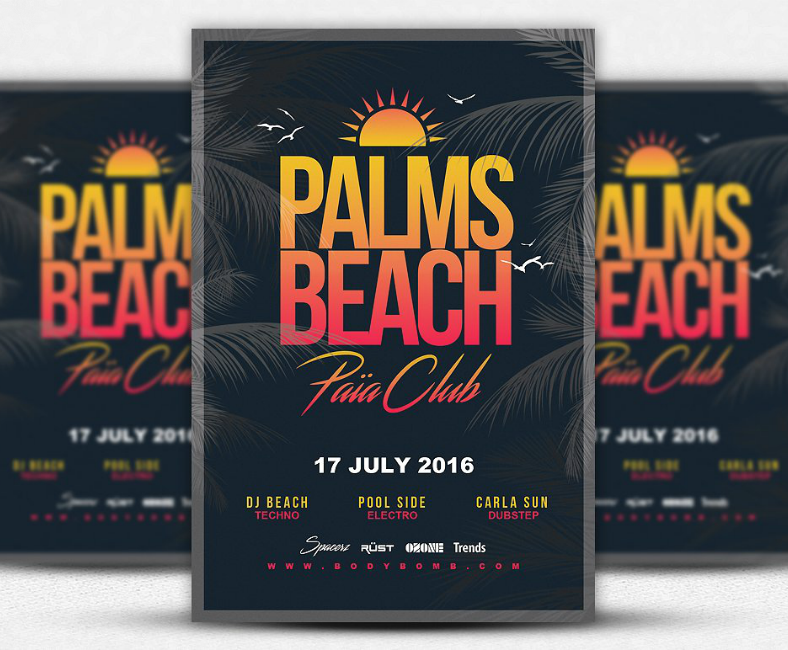 Make your party awesome by downloading and using the awesome beach party flyer template. Here, the design simply shows a silhouette image of a partying crowd with a pair of trees on the upper corners. Since this music event flyer design makes use of silhouette imagery, the bottom half is used for the textual elements. 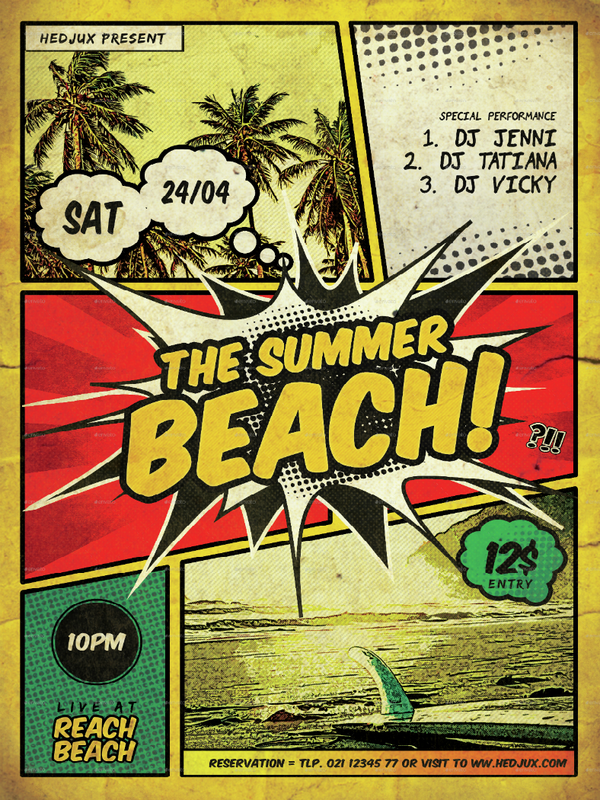 If you’re looking for a template with a minimalist yet colorful design, then the beach DJ party flyer template above may be what you need. The creativity of this design lies more on its use of vibrant colors rather than its use of graphical elements. When deciding to go with flyers for promoting something, there are a few factors that you may need to consider to be able to improve its effectiveness. Below as a list of do’s and don’ts, and other factors that you should consider before finalizing your flyers. You may also see party flyers. DO add a catchy header on the flyer’s design, something that can easily be noticed by people while still being able to give them an idea as to what your flyer may be about. You may also see party flyer samples. In addition to the previous bullet point, DON’T use cliches because they often signify laziness, especially when it comes to marketing campaigns. You may also see PSD party flyers. DO try to get as personal as you can with your flyers, let the reader feel assured that you are sincere in your campaign, and that you are indeed willing to serve them. This way, it makes the prospect feel comfortable which in turn, can help build trust. 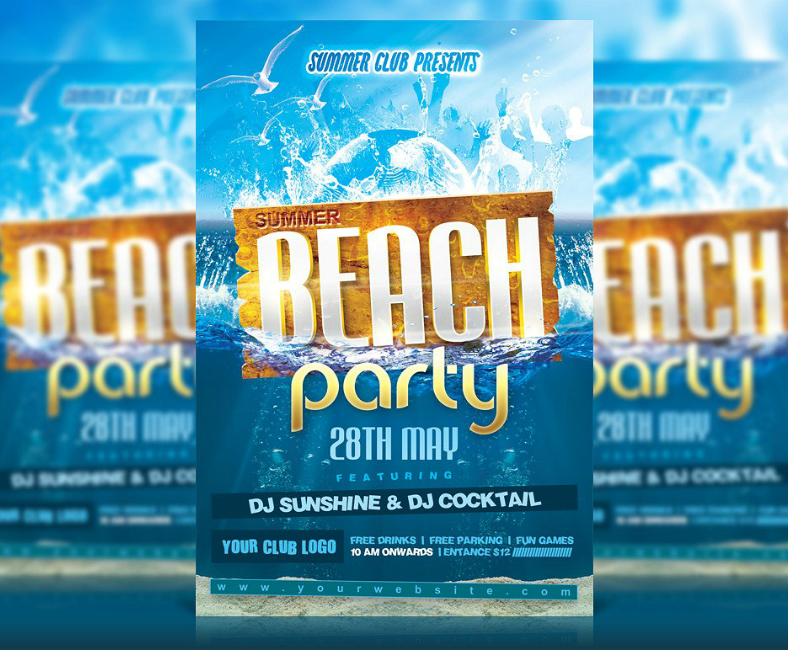 You may also see best party flyer templates. DON’T just list the services that you are trying to offer on your flyers, provide them with concrete examples and problems, and let them know your approach with regards to how these problems can be solved. You may also see pool party flyers. DO add a call to action on the on the design. This is a very important aspect to really let the prospect know that you want them to reach out to you. Include a statement indicating that they are very much welcome to call you anytime using the contact details provided on the flyer. 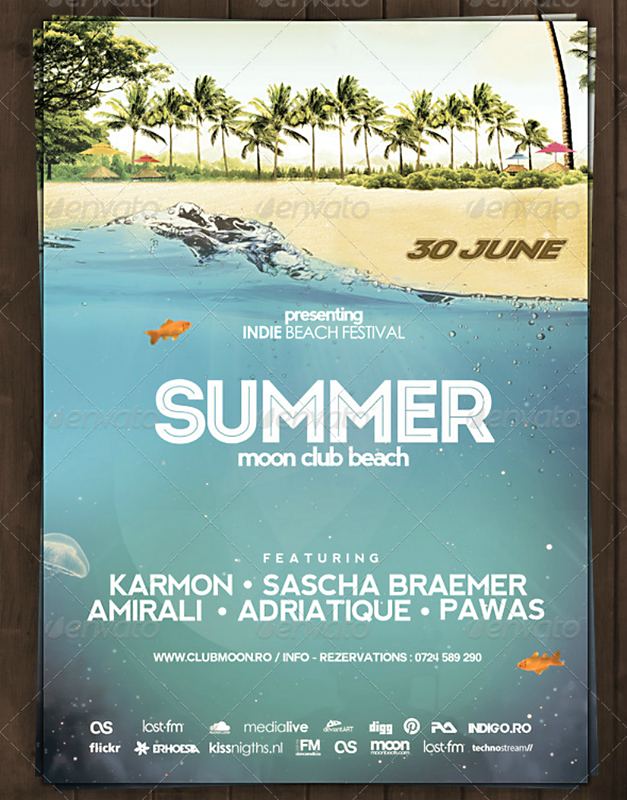 You may also see summer campl flyer templates. DON’T forget to proofread, NEVER. It is considered a mortal sin not to proofread your work before distributing or even printing it. You may also see vintage party flyers. Before we end this article, you might want to ask why you should choose the templates from our collection over those from other websites. What makes our template exceptional? The reason behind that can be summarized in two simple words: quality and affordability. First of all, you can already tell that the qualities of our event flyer templates are groundbreaking, what we can say, though, is that they were actually created by some of the best professional graphic artists. 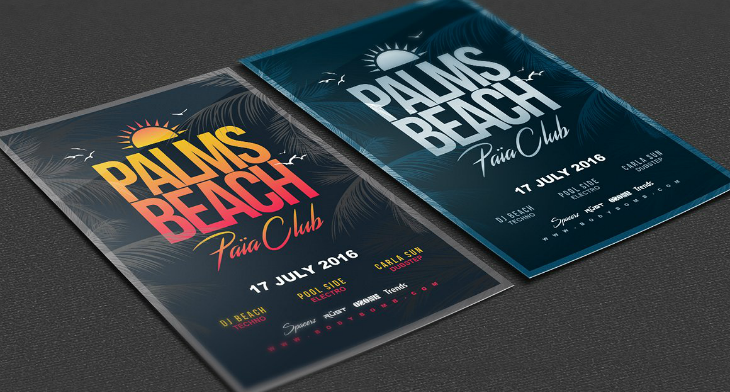 With regards to the format and its editability, these flyer templates come in fully editable PSD and AI formats, and these work best when edited using Adobe Photoshop and Adobe Illustrator, respectively. You are allowed to make as much changes on these flyer templates as necessary, and not lose quality. And finally, aside from just being easy to download, these flyer templates can also be downloaded for a rather inexpensive rate. Now are you convinced that our flyer layout templates are indeed exceptional? 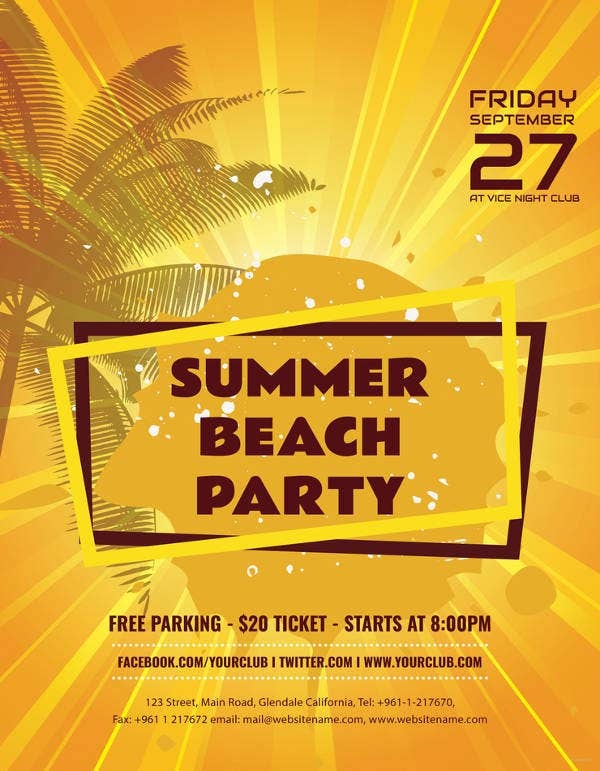 If you are, then go ahead and download one so you can start working on your beach party flyers.